"Finding Nemo" was one of Pixar's biggest hits in 2003 -- so much so that it impacted the real fish and environment it portrayed. Its sequel, "Finding Dory," swims into theaters this weekend. The Disney (DIS) and Pixar film had an estimated $54.9 million opening day Friday. It's projected to bring in between $130 million and $145 million in North America this weekend. That would make it the biggest opening for an animated film in box office history. The current record is held by "Shrek the Third," which opened to $121.6 million in 2007. "Dory," which follows the forgetful fish voiced by Ellen DeGeneres, looks to float an increasingly sinking summer box office that is down 22% from last year, according to comScore (SCOR). The film could also have an effect on the Dory fish, the Blue Tang. "[Finding Nemo] resulted in a lot of sales of [Nemo fish] clownfish, who at that time, were not being heavily bred in captivity," Matt Ferroni, supervisor of fish and invertebrates at Camden's Adventure Aquarium, told CNNMoney. "It did have an impact on the wild population." Ferroni said that pulling fish out of the ocean for sale at a rate faster than they can replace themselves produces population declines that could lead to extinction. 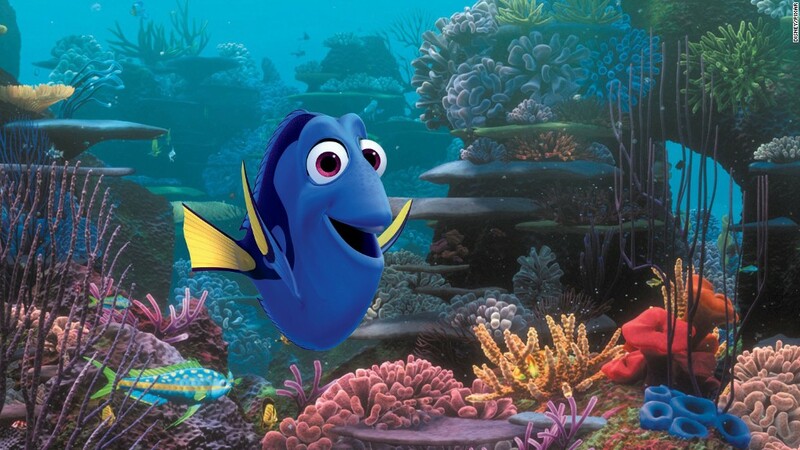 If children start asking their parents for a Dory following the new film, that could have an impact on the Blue Tang, which has a difficult time being bred in captivity. "We don't want to see mass numbers of these fish being taken... for the aquarium hobby," Ferroni said. "You have to know the care that's involved with these animals," he said. "You're not getting this forgetful fish with a lot of personality. You're going to get a Blue Tang that's not necessarily suited for life in the home aquarium." It's not all negative, however. "Finding Dory" is set to swim into theaters this weekend. After the first film, "A lot of home aquarists become very savvy in their ability to breed clown fish, to the point where they're now being bred every year by the millions. At this point, there's no reason to pull a clown fish out of the ocean." Ferroni said the film could also help start a conversation about the film's environment, the Great Barrier Reef -- over 90% of its corals are bleached or essentially dying. "We should be focused on some of these bigger issues," Ferroni said. "The bleaching of the Barrier Reef is going to have a greater effect on a whole lot of species." "Dory" could help bring attention to conservation efforts regarding the real life fish as well as other animals that make up the deep blue sea. "It opens doors for conversations," Ferroni said. "It's a whole young generation of kids that are now interested in the ocean, and in marine biology, and what they can do to try to save the world."